As the festive season is now in full swing, I wanted to share with you a lovely treat I was sent recently by Twig + Dot. 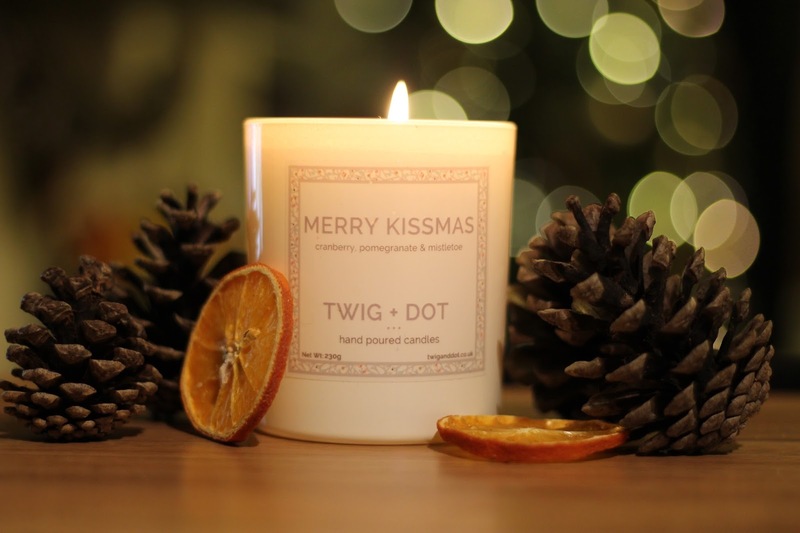 Around November time, Twig + Dot released a rather beautiful holiday range of candles to fill your homes with christmassy scents. All their candles are hand poured right here in the UK and packaged up beautifully in white jars. In the run up to the festivities, Twig + Dot have been working with bloggers in a '12 Bloggers Of Christmas' piece; each day, a blogger they haven't worked with before has posted a review on a candle they were sent, have a read of what they all thought! 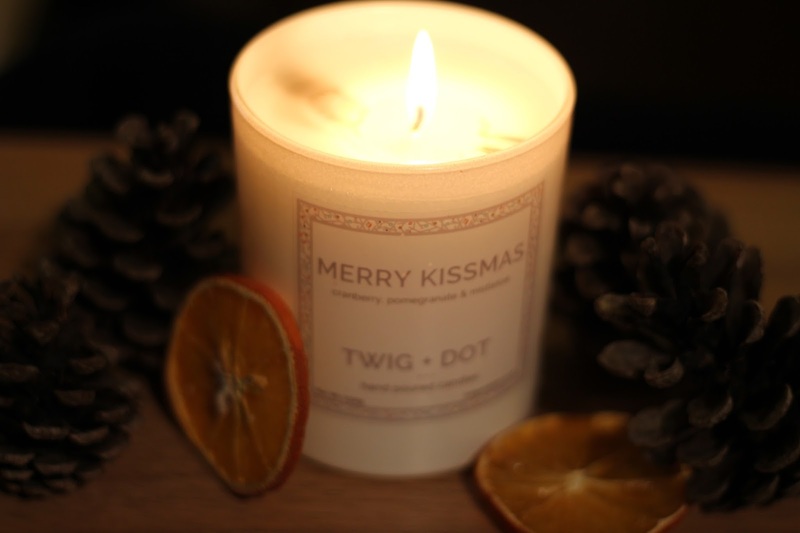 Twig + Dot candles would make a perfect stocking filler gift for any candle lover you still need to buy for. The small candles are just £3 and the larger ones, like the one above, are £16. Merry Kissmas is, by far, my favourite candle I've ever had- now thats a huge statement as I've tried out many over the years but ohhh you NEED to sniff this one. This hand poured candle is scented with cranberries,pomegranate and mistletoe. It really is as bloody christmassy as it sounds. Twig + Dot do provide burning instructions for all their candles; basically they recommend you don't burn it for more than 3 hours at a time. Fine by me though, it means my candle lasts a lot longer and the house will be smelling divine all throughout the festivities next week. 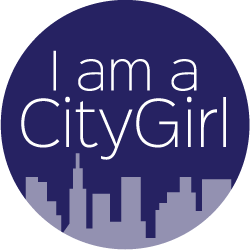 I've also been lucky enough to try out some other scents over the last few months; Twig + Dot provided us with sample sizes for our CityGirls events! This mini Pumpkin Pie candle was given to me in October as a Halloween inspired scent. With edible notes of cinnamon,clove and nutmeg this one is also perfect for an xmas scent. I love a good pumpkin pie, my mum makes one each year and this candle really does remind me of how the kitchen filled up with the scent of spices! Bahama Bay is a more summery scent and one that I adored in the warmer months; I love zesty candles and this one adds a fresh,clean smell to the lounge. I'm sad as this one isn't currently on their website but hopefully it will make an appearance again next year!? 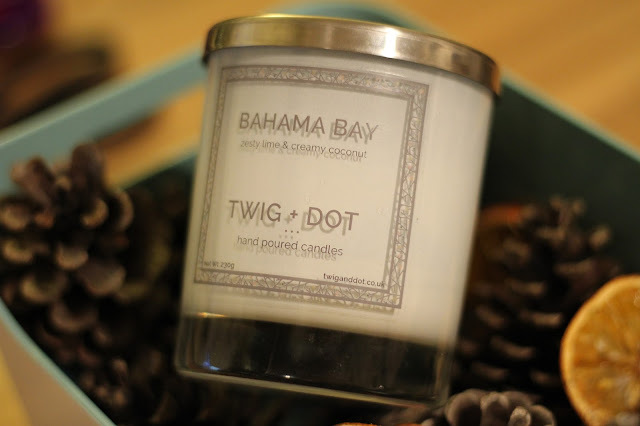 Twig + Dot really have got this candle game on point, the packaging recently changed to a fully white jar, which I really like as it makes it easier to photograph (of course this is essential for us bloggers!) and the scents range they offer is growing month by month. For sure, my go-to candle brand.. forget all those overrated well known ones.. go for something a bit different and support this UK based company! 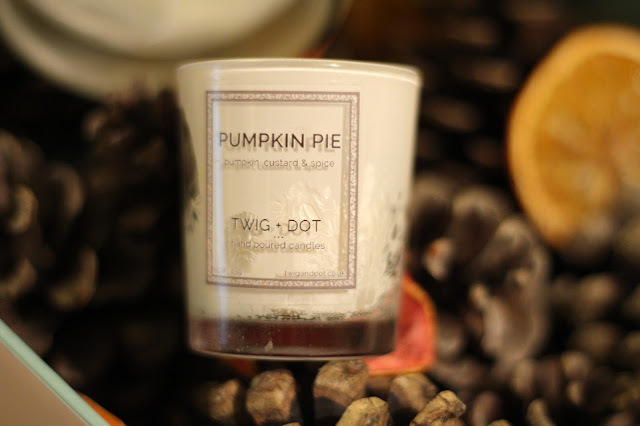 Have you tried any Twig + Dot candles yet? If not, which would you like to try out? Check them out in Twitter and Instagram too! Merry Kissmas is my absolute favourite Holly, I love that these candles just burn beautifully and really spread their scent throughout your room when they burn. They are a great buy! Nice pics too!